​Coordination of Sandwatch in Kiribati:The Ministry of Fisheries and Marine Resources has been the main coordinator of Sandwatch in Kiribati, initially through the European Union funded “Environmentally Sustainable Aggregates for Tarawa (ESAT)”, implemented through the Pacific Community (SPC). The Ministry of Education and Curriculum Development has also been an active player. Aspects of the Sandwatch methodology are being incorporated into the school curriculum. The vision of the CDRC is “Nurturing our children and young people in Kiribati to become wise and responsible citizens able to adapt to, and participate in their changing world.” The curriculum reform started in 2012 and has been undertaken for years 1-6 (years 5 - 6 are still in progress). The reform is being funded by the Australian Agency for International Development and coordinated by the Kiribati Education Improvement Programme. - Year 1 and 2 English Reader: Playing on the Beach – a story about a group of children who couldn’t play on the beach because of all the rubbish, so they involved their friends in carefully sorting the different types of rubbish and of all the rubbish, so they involved their friends in carefully sorting the different types of rubbish and cleaning up the beach and then keeping it clean. - Year 3: English Reader: Save our Beach – a story about a family who used to play on the beach and one day the beach disappeared. The children worked with their parents to build a small wall and plant mangroves to save their beach. 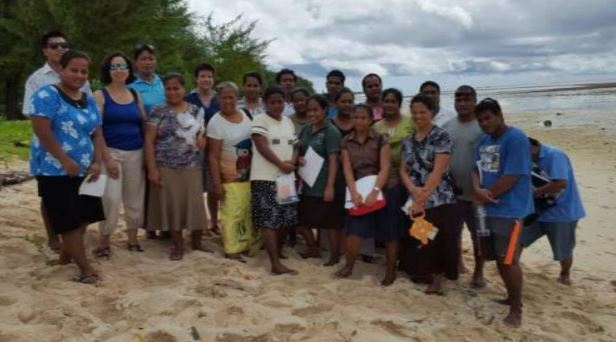 The Curriculum Development Resources Centre (CDRC), a part of the Kiribati Ministry of Education, shared their progress with integrating Sandwatch concepts into the Kiribati school curriculum during a Sandwatch Training Workshop in December 2015, supported by the Secretariat of the Pacific Community and the European Union funded “Environmentally Sustainable Aggregates for Tarawa Project”. The vision of the CDRC is “Nurturing our children and young people in Kiribati to become wise and responsible citizens able to adapt to, and participate in their changing world.” The curriculum reform started in 2012 and has been undertaken for years 1-6 (years 5 - 6 are still in progress). The reform is being funded by AusAID and coordinated by the Kiribati Education Improvement Programme. Sandwatch concepts have been incorporated in the curriculum for years 1 – 6 in environmental science and Kiribati community study. 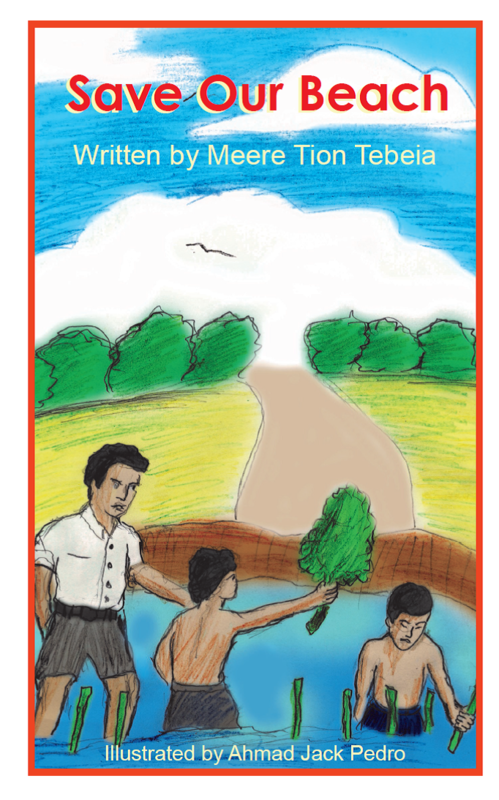 Several materials have been produced including:  Year 1 and 2 syllabuses: Kiribati Reader: Na kanga n taraua au Otanibanin. Year 1 and 2 English Reader: Playing on the Beach – a story about a group of children who couldn’t play on the beach because of all the rubbish, so they involved their friends in carefully sorting the different types of rubbish and cleaning up the beach and then keeping it clean. Year 3 Term 3: English Reader: Save our Beach – a story about a family who used to play on the beach and one day the beach disappeared. 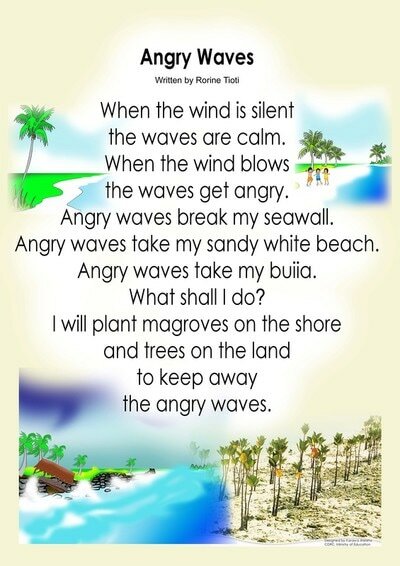 The children worked with their parents to build a small wall and plant mangroves to save their beach. The first Sandwatch training workshop in Kiribati was held in 2010. This 2015 Sandwatch training involved 25 people, of which 16 were teachers, mostly new to Sandwatch. Other participants came from the Ministry of Fisheries and Marine Resources (MFMR), Ministry of Education and the Curriculum Development and Resource Centre (CDRC), Ministry of Environment, Lands and Agricultural Development (MELAD), Secretariat of the Pacific Community (SPC) and the United Nations Educational, Scientific and Cultural Organisation (UNESCO). In February 2010, The Sandwatch Foundation received an expression of interest from the Kiribati Project Coordinating Committee for the Environmentally Safe Aggregates Tarawa (ESAT) Project about starting a Sandwatch programme in Kiribati. - Please click here for full story and photos! The Environmentally Safe Aggregates Tarawa (ESAT) Project is a European Union funded project, implemented by the Secretariat of the Pacific’s Applied Geoscience Division (SPC SOPAC) and the Kiribati Ministry of Fisheries and Marine Resource Development to support the community of Kiribati to combat coastal erosion on its most densely populated atoll, Tarawa. The atoll currently faces severe coastal erosion problems which result in the loss of land, wave overtopping and the flooding of businesses and houses and critical infrastructure such as the local hospital. This is an especially urgent issue in the face of climate change and potential rising sea levels. The local practice of mining the beaches for sand, gravel, rocks and shells (aggregate) greatly exacerbates this coastal erosion problem and is in fact one of the main underlying causes. ​From 15-17 September 2010 the Sandwatch Foundation joined together with the ESAT Project, Curriculum Development Resource Centre of the Ministry of Education, Ministry of Fisheries and Marine Resource Development and the UNESCO Cluster Office for the Pacific States to launch Sandwatch in Kiribati and hold a Sandwatch training workshop. Twenty six participants, mainly junior secondary and high school teachers, who were also joined by representatives of the Curriculum Development Resource Centre and the Ministry of Fisheries and Marine Resource Development, learnt about Sandwatch and tried out the different Sandwatch methods at a nearby beach. During the course of their work they identified four main issues impacting the beaches: poor sanitation practices, beach erosion, sand mining and poor garbage disposal practices. The Sandwatch workshop was particularly timely since a review of the school curriculum is planned in Kiribati.